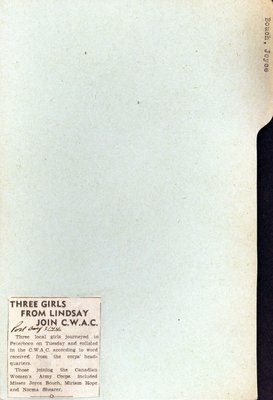 August 3, 1944 THREE GIRLS FROM LINDSAY JOIN C.W.A.C. Three local journeyed to Peterboro [Peterborough] on Tuesday and enlisted in the C.W.A.C. according to word received from the corps’ headquarters. Those joining the Canadian Women’s Army Corps included Misses Joyce Bouch, Miriam Hope and Norma Shearer.